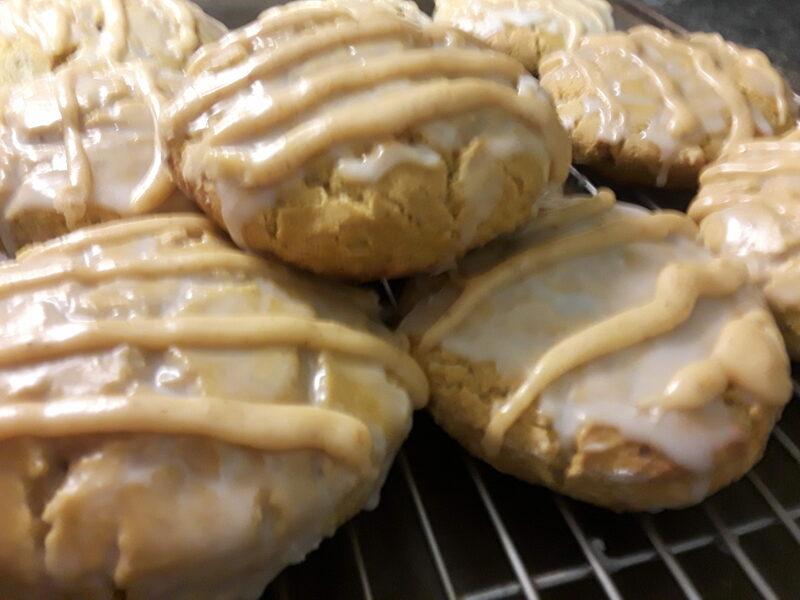 This month’s recipe is for pumpkin scones with a caramel drizzle. This scone is a good spicy, sweet treat in the morning with a hearty breakfast tea or as an after-dinner dessert. Many people think of pumpkins as little more than a Halloween decoration or a Thanksgiving pie filling. It’s time to rethink this plump, nutritious orange plant. Pumpkin is a highly nutrient-dense food. It is rich in vitamins minerals but low in calories. Pumpkin seeds, leaves, and juices all pack a powerful nutritional punch. There are many ways pumpkin can be incorporated into desserts, soups, salads, preserves, and even as a substitute for butter. Preheat oven to 425 F degrees. Set rack in top third of the oven. resembles fine breadcrumbs. Pour mixture into a large bowl. Make a well in the center. inch thick. Using a 2-1/2 inch floured cutter, cut out 12 rounds. out clean. Transfer to a wire rack and cool ten minutes (no longer) before spreading with glaze. Icing to set before serving. Charlotte and I will make the scones today. Happy Thanksgiving to you both!